A new analysis by the Public Interest Law Center of Philadelphia shows that lower income students and minority races are affected in significantly greater amounts compared to other students by the Corbett Administration cuts. In 2011 Governor Tom Corbett cut $1 billion in public school funding. As a result of these cuts 70 percent of school districts have increased class sizes, 44 percent slashed extracurricular activities and 35 percent eliminated tutoring programs. He has maintained this cut for the past two budgets and now proposes to increase public school funding by a mere $90 million. This still leaves a massive funding gap that 75 percent of public schools must account for by continuing to lay off teachers and staff this coming year. Because of this gap, Philadelphia school district is $300 million short of the budget needed to maintain its current minimal programs, forcing it to lay off 3,800 persons and strip its schools of all except mandated teachers and a principal; allowing no counselors, aides, or even a secretary to answer the phone. Data provided by the Pennsylvania Department of Education showed the average student lost $414 in funding. Because the reduction in spending by the state varied from district to district, the impact on minorities and poor also varied. Recent PDE data reveal that the low-income student on average lost 50 percent more in state funding than higher income students: $615 in spending reductions compared to $401. The disparity in cuts based on race is even more dramatic. 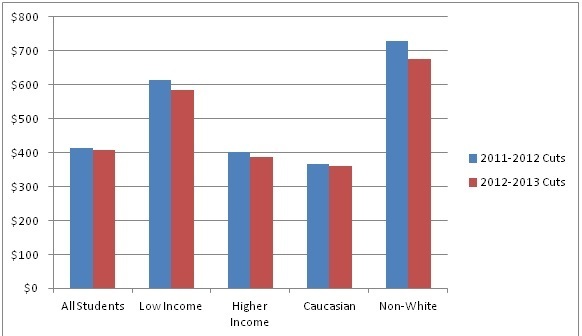 Caucasian students lost on average only $366 per student while non-white students lost on average $728 per student, twice the amount of funding cut from the average Caucasian student. Although the restoration of $39 million to distressed school districts last year helped minority and low income students, the impact of the disproportionate cuts continues. The remaining cuts, for example, are still 188 percent greater for minority than white students. Effects of Education Funding Cuts on Individual Students by Demographic Governor Corbett’s cuts to public school funding puts the education of poor and minority students at risk. He continues to widen the gap in the quality of education between students of different income levels and between students of different ethnicities. To even attempt to reduce the gap in inequalities against those most vulnerable, the elimination of these highly discriminatory cuts to public education must be a priority.